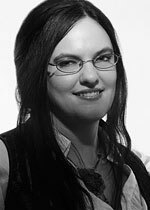 Catherynne M. Valente is an author, poet, and sometime critic who has been known to write as many as six impossible things before breakfast. She is to blame for over a dozen works of fiction and poetry, including The Orphan's Tales, Palimpsest, Deathless, and The Girl Who Circumnavigated Fairyland in a Ship of Her Own Making. She has won the Tiptree Award, the Andre Norton Award, the Mythopoeic Award, the Lambda Award, the Rhysling Award, and the Million Writers Award for best web fiction. She lives on an island off the coast of Maine with her partner, two dogs, an enormous cat, and a slightly less enormous accordion.